In this article, financial reporting solutions for Professional Services organizations utilizing Microsoft Dynamics AX will take center stage, so you can make the best software investment. In today’s business world, maybe particularly for Professional Services organizations, a modern, dynamic financial reporting tool is vital to remaining competitive in your industry, making decisions to maneuver through the ups and downs of the economy, while developing the business and your brand. This article will focus on the best financial report writers today, discussing the premier features and functionalities, so you can invest in the best reporting tool to expand your Professional Services organization’s Microsoft Dynamics AX experience. Third party software typically pulls your financial information from your enterprise resource planning (ERP) system and/or other data sources, either via a direct integration from Microsoft Dynamics AX or from a Business Intelligence (BI) data store. 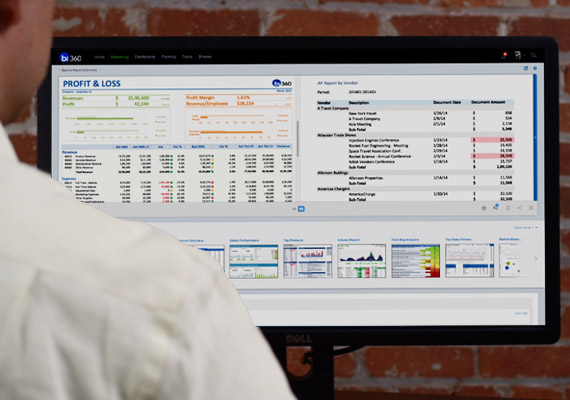 Similar to most accounting systems, Dynamics AX has a native reporting functionality, but more Professional Services agencies are deploying an independent software vendor (ISV) reporting tool because of their business user friendliness as well as impactful output that goes much further than the built-in reporting functionality. You can craft reusable report templates with the right ISV solutions, which empowers business end users to manage and evaluate their own data, with analytics to give to decision-makers regarding the future of your organization. More recently having spoken to several accounting folks at conferences toward the end of last year, conversations of Microsoft Business Intelligence (BI) stack that are “free” versus ISV products came up more than once. However, financial reporting is such an important process that you have to figure out what’s the best option for your organization as well as what fits into your current or future Business Intelligence (BI) strategy. Things to consider when shopping around: data integration options, platform choices (Excel, Web, and/or proprietary), and ease of use, among other aspects. Let’s start with data integrations as they are arguably the foundation to financial reporting. Do you need real-time analytics that can be achieved through a live integration from Microsoft Dynamics AX, or do you prefer pulling information from a BI data store, like a data warehouse or an online analytical processing (OLAP) cube, for a stronger performance? With a live integration, you can pull data right from Dynamics AX without having to first replicate company information to a cube or data warehouse for up-to-the-minute financial statements. BI data stores, whether a warehouse, a mart, or a cube, require an additional investment, but some solutions can store multiple types of data in one space. That said, if your team consists of multiple Dynamics AX users that are at times simultaneously querying significant data sets, it can make the AX server sluggish. Regarding ISV tools made for Dynamics AX, most report writers are usually live reporting or data store reporting exclusively, but not both. However, Solver’s BI360 embodies a consumer driven hybridity that can produce reporting through both live and BI data store integrations. But you also need to think about platform choices when considering which tool to implement. When it comes to your software platform options, the offerings have evolved more recently. Excel isn’t going anywhere (at least anytime soon), but the Web is becoming increasingly more popular, and proprietary platforms are still enjoying success in the marketplace. You’ll need to evaluate whether you need Excel formulas, the accessibility of the Web – or both. A few tools offer Web-based financial reporting that is powered by Excel, combining the familiarity and flexibility for accessible reporting, also giving you the capability to securely link and manage spreadsheets anywhere you can connect to the internet. Additionally, there are proprietary products that offer their own platform outside of the Excel features, formatting, codes, and functionality that most are familiar with, but one of these offerings could be exactly what you need to meet your analytics goals. If you’re looking at solutions that are hosted on the web, off site by a provider, called Cloud computing, you will be able to securely manage and analyze your Professional Service data from wherever you have the internet. You can create reports on the Web, and some solutions provide you collaboration and drill-down capabilities. In general, pure ISV Cloud report writers typically query company information from BI data stores exclusively, so integrating live isn’t an option, but you have more flexibility with a hybrid Excel-powered, Web-based tool. Today’s business culture involves a lot of teams working collaboratively, but from different locations. Web-based report writing allows for access to the data you need with flexibility. Pure Cloud product examples include Adaptive Insights and Host Analytics, while a hybrid Web/Excel solution, like BI360, allows you to create and distribute financial and project-related reports with data from Microsoft Dynamics AX right inside Excel, in a Web browser, and/or within a mobile application. You can also decide whether you want to install on-premises or in the Cloud. When shopping for the right tool, make sure that the product is business user friendly. Flexibility in the context of Web and mobile access for financial and operational report writing is only going to become more popular – and Dynamics AX users are following this trend due to the obvious perks of flexibility in accessing their data. However, what should Professional Services teams be seeking in a solution? You should be checking for report writing functionality that enables you to track information by project manager, project, agent, consultant, client, type of service, and you can typically estimate and set new customer revenue goals by reviewing previous periods. Moreover, you should be shopping for a financial reporting tool that provides the flexibility to meet your particular Professional Services organization’s analytical goals, so you can make the right decision for the direction to take in the future. There’s a lot to consider when shopping around for the right financial report writer for your Professional Services team, but the main elements include how you want to integrate data, platform choices, and specifically, the ease of use for business users and accessibility that you’re seeking to expand Microsoft Dynamics AX. Solver, Inc. is happy to answer questions and generally review BI360’s easy-to-use Excel, web, and mobile platforms for real-time or data warehouse integrated analysis and collaboration, with the option of email distribution of reports, as the best report writer for Professional Services organizations using Microsoft Dynamics AX. This entry was posted in BI360, BI360 Reporting, Business Intelligence, Collaboration, Excel 2010, Microsoft Dynamics, Solver Operational Data Store (BI360 Data Warehouse module) and tagged Adaptive Insights, atlas xl, AXUG, biznet, budgeting, Cloud, cloud reporting, excel, financial reporting, halo, Host Analytics, microsoft dynamics ax, PrecisionPoint, Professional Services, project reporting, Renovofyi, Report Writers, utilization reporting, Web-based Reporting, zap by Matthew Felzke. Bookmark the permalink.